From left to right standing: Jacobo Vilella, Frans Lettenström, Nicola Coratella, Francesc Borrull, Joao Peixoto, Martin Garrido (Coordinator Mediterranean Chapter), Juan López, and Jorge Sánchez. Sitting: Nati (wife of Francesc Borrull), Ana Lisa (wife of Joao Peixoto) and Eva (wife of Juan López). 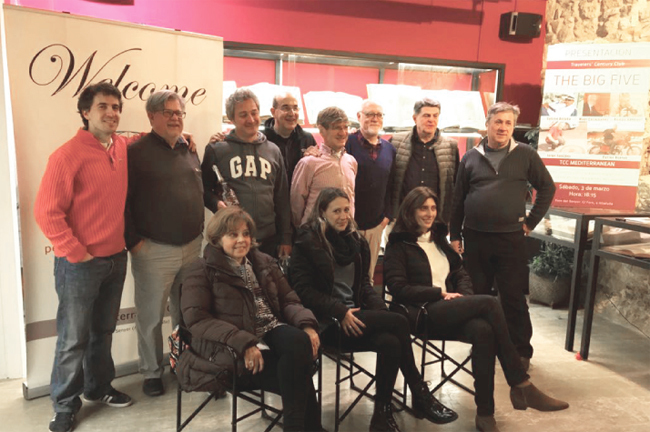 On March 3 a TCC meeting and dinner was organized in the TCC Mediterranean Chapter’s clubhouse (a beautiful private book museum and medieval bread oven) in Altafulla, near Barcelona. The purpose was to listen to and get to know the five Spanish travelers who have visited the 193 UN states (The Big Five). Unfortunately, one of them (Sabino Antuna) could not come for health reasons. However, he was fortunately replaced by Portuguese TCC member Joao Peixoto, who also has been to all 193 UN states, one of the Portuguese Big Three. After the official interviews and presentations, the photographers and journalists left and we could start our colloquium and dinner and enjoy the gourmet creations of our TCC chef Javier and his wine selections. Since we had such an especially interesting group of guests, the animated discussions and storytelling went on all night till the early morning.